Creating an Action Group is extremely straightforward. From the list or library that you’re working with, select the List or Library tab in the ribbon, and then click the Infowise “Design” icon. 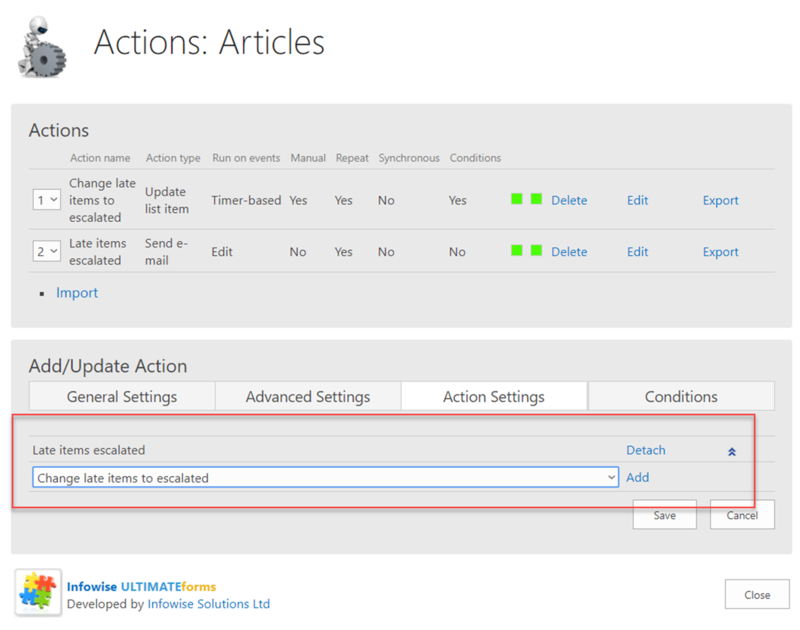 From the Infowise home page, open the Business Logic section and click Actions. 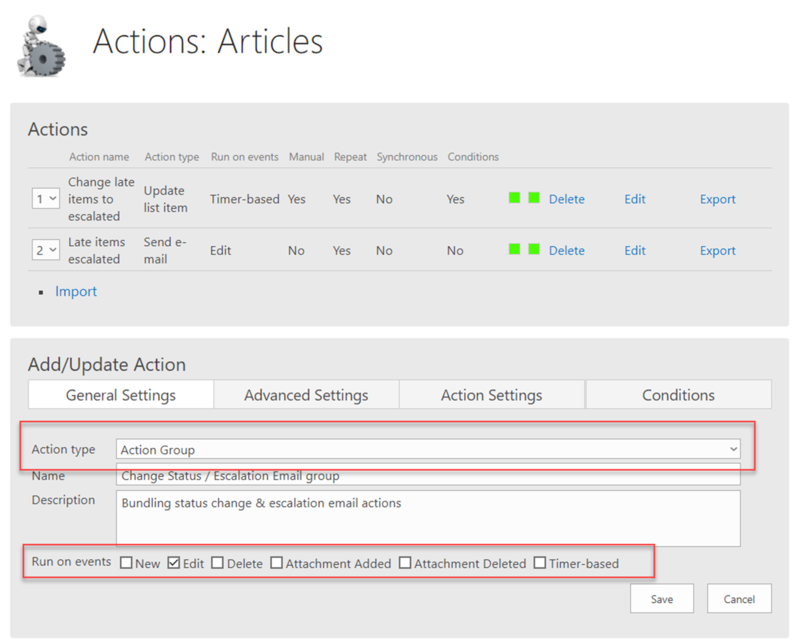 On the General Settings tab, select Action Group as the Action type. It is possible to trigger the Action Group on new items, edits, timer-based, etc., but generally Action Groups are triggered manually, in which case you should select Edit for the Run on Events value. To trigger the event manually, on the Advanced Settings tab select the manual execution option. You have the ability to change the SharePoint ribbon icon if you chose. 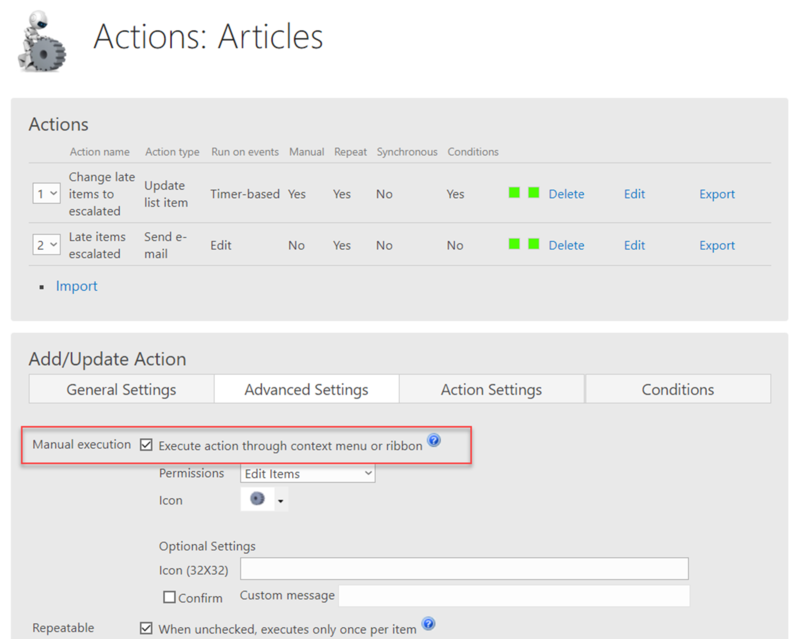 On the Action Settings tab, add the Actions that you want to run as part of the Action Group by selecting them from the drop-down list and clicking Add. You have the option to add conditions on the Conditions tab, but all conditions of the individual Actions within the group will operate as normal. Note: Individual Actions can belong to multiple Action Groups. There is currently no defined limit to how many Actions can be in a single group. Action Groups are a new type of Action that allow you to bundle multiple Actions together for simultaneous execution, typically with a manual trigger. Individual Actions can be used in multiple groups. All conditions within individual Actions still have precedence within groups.